We are determined to eat more whole grain. One big problem. I really really dislike the taste of anything whole grain. To me it is very harsh and bitter. The breads and pastas that I have bought anyway. I probably haven't explored enough for something that tastes good but after so many tries and nothing tasting good I don't try much anymore. So I am thinking homemade always tastes better than store bought. Right? I make bread all the time so why not make it a little healthier? The next problem was finding a recipe that wasn't too heavy and the flavor wasn't overpowered by whole wheat. So although this recipe isn't entirely whole grain it does use whole wheat making it healthier than my usual bread recipe. It was also easier to make than my usual bread recipe. I have seen talk about bread recipes calling for too much flour. The amount of flour called for in recipes is simply a guideline. I have never in 30 years used all the flour a bread recipe calls for. You only want to start with enough flour to be able to form a sticky ball that you can knead. While kneading you only want to use enough flour to prevent sticking. You also want to make sure you knead the bread no less than 10 minutes. It should be smooth and elastic. Dissolve yeast in warm water with sugar. Let it proof. Little bubbles will start to spread. If you watch it you will actually see it happen. The temperature in your house will be a factor in how long it takes.I tried to snap a picture of the process but it was blurry. Once it starts it happens fast. I should have had my video camera ready. Add honey, and stir well. Mix in whole wheat flour. Add in salt and butter. Mix in about 2 cups of all purpose flour. Just enough to make a sticky ball. Turn dough out onto a lightly floured surface, and knead for at least 10 minutes adding small amounts of flour as needed to prevent sticking. When dough is smooth and elastic, place it in a well oiled bowl. Turn it several times in the bowl to coat the surface of the dough, and cover with a cloth. Let rise in a warm place until doubled in bulk, about 45 minutes (in a warm home.) This could take much longer. Punch down the dough. Shape into two loaves, and place into two well greased 9 x 5 inch loaf pans. Allow to rise until dough is 1 to 1 1/2 inches above pans. Bake at 375 degrees F (190 degrees C) for 25 to 30 minutes. Remove from pan and brush with melted butter. I discovered this product a couple of years ago when I started to get serious about emergency preparedness. 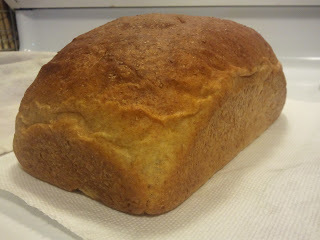 You can buy dough enhancers from several places but I really like the results I have had from Provident Pantry's brand. It is wheat gluten, citric acid and enzymes. All natural, but makes bread so much lighter. There is a recipe for homemade dough enhancer that I might get brave enough to try someday. Thanks for the super sweet comment on my button ornament. I was going to return your e-mail but alas, you came up as a no-reply blogger. Love your yummy blog..following along on google+. Thank you! I am not sure how to change it so I can get email. Lately I've been having problems with all communication on here. Someday I'll figure it all out.